COLLEGE STATION, Jan. 9, 2017 — Population densities in urban areas worldwide will continue to drop until 2050 with significant consequences for energy use in buildings, according to a study by an international and interdisciplinary team of researchers that includes a Texas A&M professor. Burak Güneralp, research assistant professor in the Department of Geography, and colleagues from Hungary, China, Iowa State, the University of Maryland, Boise State and Yale have had their work published online in PNAS (Proceedings of the National Academy of Sciences). “This is the first global-scale analysis of future urban densities and associated building energy use under different scenarios of urban population densities and demand for buildings,” says Güneralp, the study’s lead author from Texas A&M. Researchers report forecasts of future urban population densities and the associated energy use of buildings worldwide from 2010 to 2050. Their forecasts suggest that increasing urban densities could lead to greater reductions in energy use than increasing energy efficiency in many developing regions such as China. “We now have a reasonably good understanding of the scale of future urbanization over the next few decades,” he notes. “Also, there is already plenty of evidence that urban density significantly impacts urban energy use and the quality-of-life of urban residents. However, we still know very little how population densities of cities will change in the coming decades and what the impact will be in terms of energy use. This is important not only for energy use and greenhouse gas emissions but also for the well-being of people who will be living in those cities,” says Güneralp. The study looks at the future changes in urban population densities and the impacts on energy use in buildings for space heating and cooling in different world regions by mid-century. There are differences across the world regions in relative importance of urban density and energy-efficient technologies. In developing regions, urban density tends to be the more critical factor that determines building energy use whereas both urban density and energy-efficient technologies matter more or less the same in developed regions. Globally, annual energy use for these purposes is expected to increase by only 7 percent assuming the most compact urban growth and most advanced technologies. However, it can also increase by as much as 40 percent, assuming the most dispersed urban growth and no significant advances in technology. The researchers assumed fixed regional population projections; hence, in their analysis, higher urban-density futures are equivalent to compact development whereas low urban-density futures are indicative of dispersed development. They also focused only on direct energy -- energy used in cooling and heating of buildings. Although the indirect energy, such as energy consumed in construction of a building, is also considerable, over time the direct energy use tends to exceed indirect usage. The researchers forecast that China, Europe, and North America would account for the bulk of the future cumulative energy use for heating and cooling through 2050. 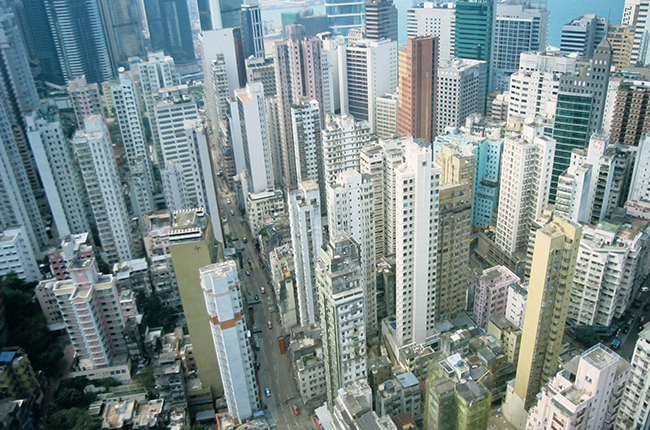 Continuing declines in urban population densities are primarily responsible for these trends. In North America, urban population densities are expected to decline from 5473 person/square-mile (21.13 person/hectare in 2010) to between 2644 to 5449 person/square mile (10.21 to 21.04 person/hectare) in 2050, the study shows. As a result, annual energy use for heating and cooling will increase on average by 15 to 30 percent. In comparison, China’s annual energy use for heating and cooling would increase on average by 35 to 50 percent and exceed the energy use of North America across almost all of the scenarios by mid-century. The analysis shows that energy-efficient technologies such as retrofitting will play an important role in reducing building energy use, especially in cities of the developed world where most of the building stock is aging and energy-inefficient. However, the same is true also for China whose cities, after decades of phenomenal urban growth, now have an abundance of poorly constructed, energy- inefficient buildings, the authors say. “Retrofitting” refers to the addition of new technology or features to older systems. In the study, it refers to improving existing buildings with energy-efficiency equipment to save energy used for building heating and cooling. The findings from the study also indicate that retrofitting existing buildings after the most advanced energy-saving technology is widely available could yield greater energy savings than premature retrofitting.